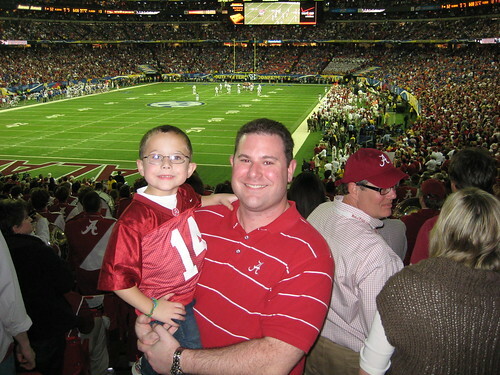 George and Bradley at the SEC Championship Game, originally uploaded by gbhicks55. I got an incredible early Christmas present last Friday – two tickets to the SEC Championship game in Atlanta. It was a whirlwind trying to make plans at the last minute. April was scheduled to work the day of the game and we couldn’t find anyone to keep the kids. After making some frantic calls, April was able to get off work but we had nowhere to leave the kids. I really wanted April to go. We talked it through and decided it would be a great chance for me and my son Bradley to spend some time together. I have to admit that I didn’t anticipate what a challenge it would be to get a five year old to one of the biggest football games in the Southeast! I talked to a friend familiar with Atlanta who suggested I park north of town and take MARTA (Atlanta subway) to the Georgia Dome. Bradley couldn’t be more excited about that plan – he LOVES trains!! The idea was to avoid the congestion that would most like occur from everyone else boarding MARTA on the west side of town closer to Alabama. We left the house at 8 am and stopped by Chik-Fil-A for a biscuit. That really got the day started off right!! It was a good trip to Atlanta. We got to see a nice snow dusting in Birmingham and along I-20. We rolled in to Atlanta about 3 hours later and made our way to the MARTA station. It was frigid outside while we waited for the train! Bradley could hardly contain himself as we watched for the train to arrive. The train pulled up and we got on. After riding for a few minutes, Bradley turned to me and said, “Dad, this is the best day ever!” I nearly lost it!! I was so glad I decided to take him. There were a lot of fans taking the train with lots of goodhearted cheering for both teams. The biggest challenge was holding on to a five year old in the middle of a crowd of thousands of people. Most folks were considerate, but it was hard to avoid Bradley when he only comes up to your waist! Most folks didn’t even know he was there!! We got off at the Dome station and followed the crowd to the convention center where we grabbed a bite to eat for lunch and went to the SEC Fanfare event. Bradley loved SEC Fanfare. There were games to play, prizes given away, football players to see, pep rallies to watch and popcorn to eat! The highlight was watching Bradley run an obstacle course for kids. He was probably the smallest kid there, but it didn’t slow him down a bit! We headed to the Dome about an hour before kickoff and made our way to our seats. Bradley wanted to get a giant Bama hand and I picked up a program. Our seats were great! We were only 15-20 rows away from the field and right behind the Alabama band. We had fun watching the game and experiencing the band so close! Bradley stood on his seat for the entire first half and really got in to the game. The folks around us were great – they doted over Bradley the whole game! I looked over at one point and the lady next to Bradley had given him her bag of peanuts. He wolfed down the whole bagl!! Bradley stayed focused on the game until halftime. We each got a hot dog for supper and watched the bands play. Bradley lost interest and want to play his DS. He kept one eye on the game while he played and I told him when something exciting was going on. It was the most exciting game I’ve ever attended! The atmosphere was electric and the fans stayed in the game. The band played after every down and the Bama fans got more excited as the game ran its course. After making sure that the game was secured for Alabama, we left with about 3 minutes to go. I wanted to hit the subway before the crowd. That’s when the real adventure began! We didn’t have any trouble getting to the MARTA station near the Dome. We were outnumbered by Florida fans who left early. They all looked depressed and much quieter than before the game!! We transferred at the Five Points hub and I knew that we had to get on the north bound train. We got on the train, got a seat, and off we went. I knew we had several stops to make, so I settled in and waited for them to call our station. I started getting nervous after the crowd thinned to just a few people on our train. A lady in front of us turned to talk to Bradley and we struck up a conversation. She and her husband lived in Atlanta and had been to the game. After telling her where we got on MARTA, she frowned and said we were on the wrong train! There was one north bound train that left Five Points, but the line branched at Lindbergh station. One train went northeast and the other went northwest. We should have gotten off at Lindbergh station to get to our stop. Instead, we stayed on the wrong train until it reached the end of the line! Another lady on the train told me that the only way back to Lindbergh station was to catch the south bound train, but it only ran every 20 minutes on Saturdays. We had just passed the south bound train, so it would be a while before we could catch it again. We had to get off at Doraville whether we liked it or not. We got out on an the platform and were immediately hit with a blast of cold air. It was freezing out there and Bradley started to shiver. I knew we couldn’t stay out in the cold, so we went down to the lower level. I saw a MARTA bus in front of the station that said “Lindbergh” on the front and I figured that was my best shot. We boarded the bus and started our long journey back to the station. We got an interesting tour of Atlanta at night! We finally made it back to Lindbergh station and I went to the turnstile to use my pass. It was rejected! I finally figured out how to buy another one and we caught the correct train this time! We rode the train to Dunwoody station and I couldn’t be happier to be in the right place! Then I lost my truck!1 There were two parking decks at the station and it took us a while to find where I had parked. Cold and tired, we finally got in the truck and headed back to Birmingham – an hour behind schedule. A couple of bathroom breaks later, we were on I-20 and cruising toward home. Bradley was a trooper through the whole experience. I never let on that I was uptight and he though it was fun to get to ride a train AND a bus! I had a chance to mull over the whole experience as Bradley nodded off to sleep. I was so grateful for the opportunity to go to the game. It was a once in a lifetime experience. But more importantly, I’m so grateful for my incredible wife and kids. It was such a privilege to spend time with my son. I was also reminded what an awesome responsibility I have as a father. Bradley depended on me to guide him and protect him. I thought about how important it is that I guide my children through life while I have them. As parents, we must take seriously our responsibility to teach our children the truths of God’s Word. We must take them by the hand and teach them how to live a godly life. We have to be an example for them as we face good experiences and bad. We must protect our children from danger until they are old enough to take care of themselves. I thank God for the many blessings in my life! This game was insignificant compared to the spiritual events in my life, but it was more than just a game. It was a chance to teach my son and experience life together.